We settled on the Worm Factory 360. It looks enough like a Japanese Stone Lantern that it could be argued that it is decorative. We supplement our system with a bamboo compost pail for the kitchen. And, we spend an evening making our worms comfortable. A snapshot of our colony on feeding day. 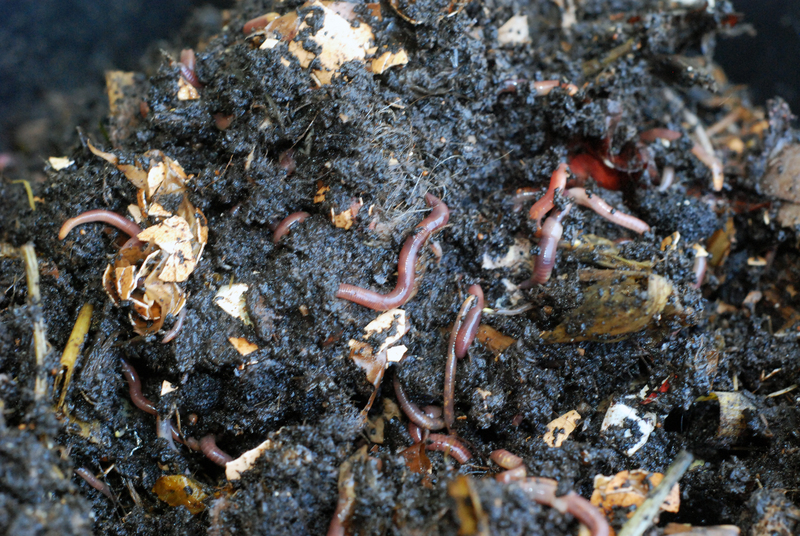 Our worms get regular doses of coffee grounds and tea leaves, toilet paper rolls and scrap paper and linens. They also get a lot of egg shells, banana peels, okara (when I cannot find a use for it in time), and bread that goes mouldy. And they are thriving. Sure, we are still trying to figure out the right mix of brown and green (see pdf below) to add to the mix, but we are learning. This pdf is useful for helping us determine what browns and greens our worms needs. At six months, we even expanded our bin by adding a new layer. All winter things moved along fine, albeit a bit slowly. But as Spring set in, so did culture shock. Our worms were reluctant to move to the new layer. Worms were escaping both the bin and the balcony. Other bugs started to appear. The worm castings on the second layer were WET. We could not get them to dry. We are now trying to manage moisture, bugs and a growing ickiness-factor (at least on my part, Jean-Francois seems to enjoy mucking around in the compost). And, we have no way to share our worm tea or our beautiful worm pooh with gardeners. The grounds here are landscaped by a company that has no interest in going green. Any thoughts on how apartment building and condo dwellers can help urban gardens and communities by composting? We are moving to a street lined with apartments, and I’d love to find a community solution that we can advance. It may also be a way to help people eat better and waste less food BEFORE it goes to the compost. TLC, special on how to make and use compost without a yard of your own. BTW, I would not recommend the bamboo pail. It looks old and beaten up after two months and is also too soft a material for life on our kitchen counter. This entry was posted in On food waste, Taking action and tagged compost, natural history museum, On food waste, sustainable living, trash, Vermicompost, wasted food by Bonnie Lee. Bookmark the permalink. Boy, I wish I could make a suggestion. All I could think of was a community garden. Most municipalities have those where either you grow your own food, or organizations do (like Cooperative Extensions) to provide for people of need. I had to chuckle that your worms were escaping. I too would find that unnerving not knowing where to find them next. They must have had a rude awakening to freedom though when the birds swooped in. Funny, I did not stop to think that the poor delinquent worms were terrified. : ). I know that here in Seattle we have a large and thriving community gardening scene. The city has a program of multiple locations where they provide space for organic gardeners to grow veggies. The county runs a similar program that is quite robust, but does not have quite as many locations. There is an electronic bulletin board for these groups and they are always looking for such fine fixings. I would look through the internet for something similar in your area. Thanks for the suggestions. After reading your comment, I Googled my soon-to-be neighbourhood for city and community programs. I found out there is a community farm nearby called Ocean View Farms. The have a 3 year wait list for membership, but they also have a call out for volunteers to serve on the compost committee. I also found a community college that offers courses on sustainable urban solutions and food preservation. Looks like you have helped put me in motion. Thank you again. Thanks! This is something you never see…. You are welcome. We’d be happy to share all our photos of our worms, proudly, if you’d like! Hope your worms are doing better!